Are you having problems with your sewer line? It really isn’t something you want to mess around with. It may only be cracked or leaking now, but small problems now mean much bigger problems down the line if they don’t get looked after properly—and those can manifest, quite literally, down the sewer line that leads to your home. You could wind up with backed-up sewage or a sewage leak in your home, and that can lead to some very costly and very necessary repairs, not to mention the health risks. How do you prevent these escalating costs? With trenchless sewer repair. Unlike some more traditional forms of sewer line repair, trenchless sewer repair can save you the cost of cleanup after the fact by preventing damage to your yard during the repair process. How does it work? Trenchless sewer repair can repair the sewer line in its entirety without having to dig to expose the length of the pipe. It does this by taking a brand-new pipe and pushing (threading) it through the old, damaged pipe. It’s called re-lining. The new pipe will become your sewer line, complete, intact, and crack-free, and the old sewer line will shatter as the new one is being installed—so it won’t get in the way or cause problems, and you won’t have to re-landscape your yard after your repair is completed. On top of the fact that you can get a whole new sewer line without having to carve up your yard and spend hundreds to thousands of dollars re-landscaping after-the-fact, and in addition to the fact that trenchless sewer repair means you can get a complete and all-new sewer line pre-emptive to any serious problems with your old pipes, your new pipes will be made of newer, longer-lasting, and more environmentally friendly materials. You can opt to have polyethylene pipes installed by select plumbers. These pipes are not jointed, which means they are less likely to sprout leaks. Plus, the material is much longer lasting, which means they will easily surpass the lifespan of your old sewage pipes, and their joint-free and composite structure will also help prevent the common sewer line problems that cost money and time to repair. For instance, polyethylene pipes are designed to maximise water flow, which will increase the functionality of your system; they are also resistant to tree roots, preventing the all-too-common root blockages from causing problems with your household plumbing and leading to the potential for sewage back-ups. Finally, your new pipes will be made from non-hazardous and more environmentally friendly materials. We all want to go a little greener, so why not start with the pipes that are buried under your vegetable garden? What are the benefits of going with a professional for the job? A lot can go wrong with sewer line repair. A professional plumber can ensure the job is done to code so you don’t have to worry about any mistakes leaving you with a basement full of sewage. Plus, a professional sewer line repair or replacement company knows your area and all the legal processes involved in sewer line repair. In most cases, sewer line repair requires a permit, and a professional plumber can manage all the appropriate paperwork to ensure you get the permit you need to have the work completed in a timely fashion—before the problem you are having with the sewer line gets any worse. A professional plumber will also have a professional series of protocols to follow, including using video camera inspection to determine and assess the nature, cause, and extent of the issue. This will prevent you from performing over-repairs if only one small section of your sewer line is blocked or needs to be replaced. 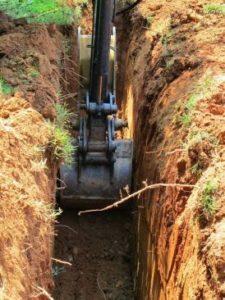 Any mistakes simply add to the costs of the repair, and you don’t want your backyard to wind up looking like a golf course (or like the archaeologists are coming) because an unprofessional service has had trouble locating your sewer pipe. There are a lot of other pipes that could be running underground, including buried electric lines, gas lines, your phone or cable line, your water main: all things you likely don’t an excavator to cut into by accident. If you need plumbing services in Los Angeles to help with sewer line repairs, don’t just hire any plumber out of the phone book. Hire a professional who has experience performing trenchless sewer repair in Los Angeles. Get to the bottom of your plumbing issues without having to bottom out your bank account in the process.